The next day the large crowd that had come to the feast heard that Jesus was coming to Jerusalem. So they took branches of palm trees and went out to meet him, crying out, “Hosanna! Blessed is he who comes in the name of the Lord, even the King of Israel.” And Jesus found a young donkey and sat on it, just as it is written, “Fear not, daughter of Zion; behold, your king is coming, sitting on a donkey’s colt!” His disciples did not understand these things at first, but when Jesus was glorified, then they remembered that these things had been written about him and had been done to him. We do not live in Jesus time anymore. He lived two thousand years ago. It is a long, long time ago. We live in 21st century, and our world is very different in so many ways. It is better is many ways. We need to give a credit to Christianity, for it was Christianity that changed this world. However, there are things which haven’t changed all that much. There still is a brokenness in this world. Everyone can see it, everyone can experience it. Everyone knows that things in this world so often don’t happen in a way they should. There is something wrong with our world, and there is something wrong with us. We all experience it daily, not just Christians, every human being. Injustice, ingratitude, foolishness, unfaithfulness, selfishness, anger, hatred, jealousy, slander, deliberate attempts to hurt and humiliate and deceive. We experience all of these in different context. We can experience it even in our closest relationships, in our families, among the most important people in our lives. Among relatives, among friends. In our workplaces, in community, and so on. We can experience it from others, but if only we are honest, we also realize that we are not free from these vices ourselves. They keep springing up from the depth of our hearts, we want it or not. It hurts, sometimes a lot, it hurts us and hurts others, and this is not right. We share these experiences with people who met Jesus on that very first Palm Sunday, many years ago. They had similar experiences. Besides they were under the yoke on the Romans, waiting for someone to liberate them. But now, now they had a hope. What was this hope? They had a hope that finally there is someone who could put things aright. Someone who can return the glorious times of the king David. Someone who had proved that He indeed had a power and abilities to do it. His name was Jesus. Jesus from Nazareth. He had been around in His public activities already for good three years. During this time He had healed a countless number of people, cast out a countless number of unclean spirits. He had performed miracles that no one would be able to perform. It looked like He had a power over everything. It looked like that He could do whatever He wanted and no one, no one could resist Him. He had been teaching about the Kingdom of God, which already was near. The Kingdom of God… People loved Him… or at least they loved what He did. And just a few days ago, He had done something that had shaken the whole Jerusalem. There was a man, named Lazarus, a good friend of Jesus. He had gotten sick and died. Jesus arrived only when he had already been in the tomb for a few days. And – Jesus prayed to God the Father and commanded Lazarus to come out of the tomb. And… he did. Many saw it with their own eyes. Many more heard about it and went to see Lazarus, to check whether this was true, for it was not easy to believe a story like this. Nevertheless it was true. Then “the large crowd that had come to the feast heard that Jesus was coming to Jerusalem. So they took branches of palm trees and went out to meet him, crying out, “Hosanna! Blessed is he who comes in the name of the Lord, even the King of Israel.”” All of this looked very much like a victory parade. I assume you all have seen old chronicles about solders returning after their victory in WWII. People were meeting them with flowers and shouts of joy. The victory was won, peace was granted, there was an abundance of reasons for celebration. This is exactly how we can understand what happened in Jerusalem on that day. Branches of palm trees were a symbol for the nation of Israel. They were used to celebrate Israel’s victories in the past. In this context we can understand that the use of palms signified that people were hoping for the nation’s liberation once again. Add to this spirit this quotation from Ps 118 ‘blessed in he who comes in the name of the Lord, even the King of Israel’ and it becomes very clear what they were hoping for. That this Jesus, that He will bring them freedom, that He will put things aright. In a way they were right. He was heading to Jerusalem for a victory. For the greatest victory ever. But there was a catch, or we can say there was a problem with this Saviour. There was something that people seemingly didn’t notice. Something that didn’t fit in this picture of a victorious king. Do you know what it was? Something that looked awkward in this picture. What do kings and victors use for their parades? Chariots. Horses. What was Jesus riding on? “Jesus found a young donkey and sat on it, just as it is written: “Fear not, daughter of Zion; behold, your king is coming, sitting on a donkey’s colt!” What kind of king does it? Sitting on a donkey… That’s where the problem was. What did these people expect from Jesus? What do we often expect from Jesus? That He will protect His people. That He will come and help us to triumph over our enemies, that He will solve our problems and give us what we want. This is what our hearts desire. Peace and well-being in this world. We often look at Jesus and hope that He will free us from all bad things and bad people around us, and will help our lives to go the way we want them to go. But He was riding on a donkey. What people didn’t get on that day, and what we sometimes struggle to accept is the fact, that He is a very different King, and His victory is a very different victory. Even “His disciples did not understand these things at first, but when Jesus was glorified, then they remembered that these things had been written about him and had been done to him”. They thought that Jesus is bringing them a local victory, victory over their enemies, their oppressors. Helping one group to triumph over other. But Jesus wasn’t coming to triumph over a certain group of people. He didn’t take sides. He hadn’t come to save us from sinners. He had come to save sinners, that is, us. He was coming to triumph over enemies of the humanity, over those very powers which cause things to go wrong in our world. He had come to defeat the powers which cause injustice and unfaithfulness, selfishness and anger, hatred and jealousy, sickness and death. He came to give a hope to the whole humanity, to give a freedom not simply from enemies around us, but from the enemies which kept enslaved our very hearts, our very lives. But sometimes we don’t want to be saved from our sins and death. For some of our sins can be rather dear to us, and death seems kind of rather far from us right now. We just want God to do for us what we want. How much they misunderstood what was going on… We need to be aware that we are prone to make the same mistakes. We may come to Jesus expecting that He will serve our needs, and that He is here to help us out with our little problems. Very often He does. Even as He helped multitudes that came to Him. But not always. For the main reason for His coming is not to solve our daily issues, but to free us from our true enemies. From sin and from death. When we are stuck in our daily struggles, we may not see that they are our real problem. When daily problems hurt you, you may not be able to rejoice knowing that eternal live, that new heaven and new earth are yours. But they are yours! Jesus has won them for you, and it is something much, much larger then we can understand. We can’t understand how God did all of this. We can’t understand how He became a human being, as one of us, and even less we can comprehend how His death and resurrection has won for us this victory. But you can know for sure, that if only Christ is with you, neither sin, nor death have power over you. Sure we still live in this broken world, but they can’t destroy you anymore, you don’t need to fear them anymore. You are free. Jesus gives you His Spirit to be with you. By His Spirit, which He gives you in your baptism, which He gives you in His Word, which He gives you today, when you hear your pastor preaching, which He gives you today in His Holy Meal, by this Spirit He includes you in His victory. It may not solve all your daily problems. If may not give you immediate triumph over your enemies, it may not remove all injustice, it may not fully erase sinful desires from your hearts, but it gives you something much, much greater. You receive Jesus victory. As the apostle Paul said ‘if you die with Jesus in your baptism, then you can be sure that you will raise with Him as He rouse from the dead.’ And that is much more that we could ever dare to hope. New life. With God. Besides. Do you know what you need to do to get your share in this victory? Do you know what you need to do to inherit God’s Kingdom? That is so important. Do you know the answer? You need to do – nothing. Nothing! For everything is already done. Jesus has done it all. I know it’s not fair. We want to do at least something, but there is nothing left for you to do. You only need to desire to receive what He gives you. That’s it. It may sound easy, even too easy, but, in fact, it is very hard. We are used to fight for things we want, to bargain, to work hard to get them. But here – the most precious gift of all, – come and simply receive it! It doesn’t matter how unworthy you are, how undeserved this gift is for you. It is undeserved for all of us. But Jesus gives it to you anyway, for He knows how much this gift, these good news can change your life. This victory is too great for us to be able to contribute to it in any way. That’s why God did it Himself. 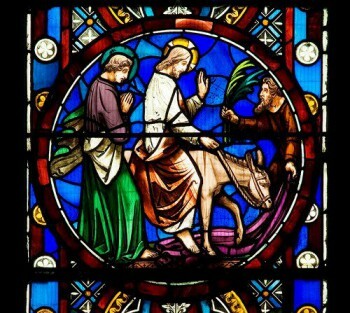 Riding on a donkey towards His cross. This victory is His gift to you, to each of you. Besides, and this is important, He gives you this gift right now. This is how it works. When you hear your pastor preaching, Jesus uses Him to speak to you. He wants you to know and trust, that He has won this victory for you and that everyone, everyone qualifies to receive His gifts. You too. Everyone. No merits required. So what are we then left to do? It is simple – join the parade! Join the parade where we celebrate the greatest victory of all times. Join the parade where we greet our Saviour and our King. How? Right here. Whenever we celebrate the Divine Service, whenever we come together as Jesus has commanded us to do, whenever He Himself comes to be among us in His Holy Meal, we are joining the parade. That’s why we sing, ‘hosanna in the highest, blessed is He who come in the name of the Lord’, the King of the Kings, Jesus Christ. So – join in, receive, rejoice and invite others to join this parade. For this victory Jesus has won for everyone. Also for those who still haven’t receive it.